Public cloud use is on the rise. Multi-cloud solutions are the primary strategy for large companies, with public cloud use gaining steam. Thirty-eight percent of enterprises represented in the seventh annual RightScale State of the Cloud survey have made the public cloud a priority for 2018, up from 29 percent the previous year. The industries expected to spend the most on public cloud services in 2018 are discrete manufacturing, professional services, and banking, according to IDC. The telecommunications, banking, and professional services industries are expected to see the most growth in cloud spending over the next five years, with IDC expecting each sector to see increases of almost 25 percent by 2021. The container orchestration battle is over and Kubernetes has emerged as the undisputed winner. Industry insiders, like Forrester, have predicted Kubernetes as the winner and now the data proves this out. According to the State of the Cloud survey, Kubernetes shows 27 percent current use while Docker Swarm shows only 12 percent adoption. Use of Mesosphere clocks in at only 6 percent, but the report doesn't distinguish between Marathon or Kubernetes and Mesosphere supports both. The data could further be skewed by showing container orchestration offerings from AWS, Azure, and Google Cloud as separate segements when in fact they all run Kubernetes. While there's some muddiness in how people are consuming Kubernetes, what's clear is that the market has spoken and Kubernetes is the de facto way to do container orchestration. Azure is hacking away at AWS’s lead in cloud infrastructure services. Amazon Web Services has the lion’s share of the infrastructure-as-a-service (IaaS) market, but Microsoft’s Azure is closing the gap with growth that is outpacing its top competitor. Azure adoption grew by 89 percent in the second quarter, ending Q2 with an 18 percent share of the market, according to a report by Canalys, an independent analyst firm. While still in the lead with a 31 percent share of the market, AWS’s second quarter growth was substantially less at 48 percent. Google Cloud rounded out the top three performers of Q2, growing a massive 108 percent during the quarter. Google ended the quarter with an eight percent share of the cloud infrastructure services market. Azure, AWS, and Google Cloud account for 57 percent of the IaaS market, Canalys reports. Enterprise cloud spending is on the rise. Companies are making heavy investments in the cloud, as seen by IDC’s decision to increase their 2018 spending prediction at the half-year mark. The market intelligence agency now expects to see a more than 21 percent increase in cloud infrastructure spending this year, which aligns with reports from enterprise survey respondents. Twenty percent of enterprises say they plan to more than double their public cloud spend in 2018, according to the State of the Cloud survey and 71 percent of the poll’s 997 respondents expect to increase their public cloud spend by more than 20 percent this year. Security remains a top cloud challenge. Security regularly ranks as the number one concern among cloud adopters. Seventy-seven percent of State of the Cloud respondents reported security as a challenge, with 29 percent finding it to be a significant hurdle, particularly for beginners. Sixty-six percent of those surveyed in LogicMonitor’s Cloud Vision 2020: The Future of the Cloud Study reported security as the biggest challenge for organizations operating in the public cloud. 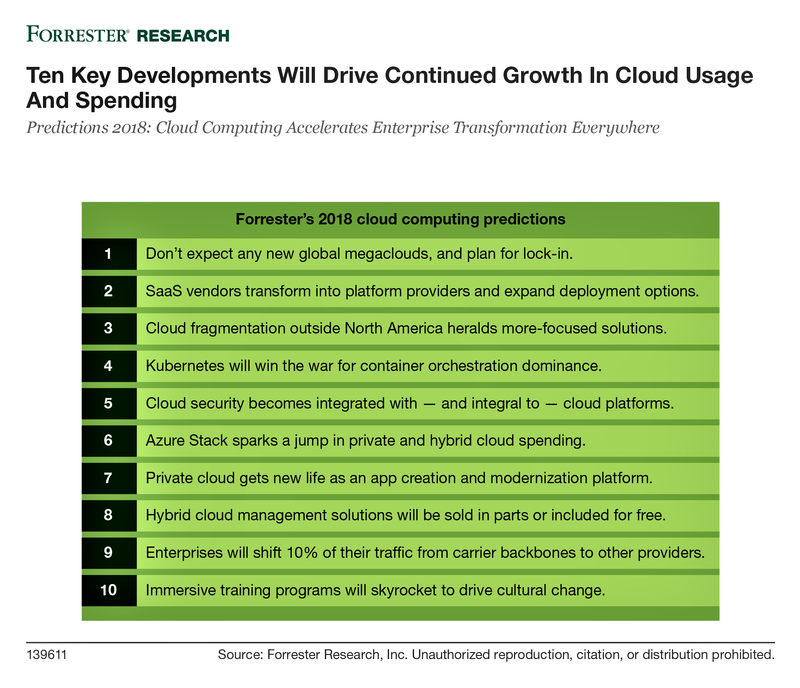 With security being a top priority for enterprises working in the cloud, Forrester anticipates that security will become “integrated with — and integral to — cloud platforms” in 2018. Check out our rundown of 2018's top five cloud trends via @arickaflowers Click to tweet!